Milberger Farms – That's Natural! Shane Milberger is a first-generation farmer in the Pueblo-Avondale area. Milberger says that his father encouraged him to start farming because he didn’t want Shane “running around with his buddies”. A friend, helped him to get the operation started, and today it is a boon of activity with several product lines, a retail store, and Milberger selling to large retailers and restaurants in the state and beyond. Milberger got started around 1985 (sophomore year in high school) – on “the Mesa” – an area about 7 miles east of the City of Pueblo. He started by renting a farm from the neighbor. Since then, the operation has grown. It is a family-business. Milberger’s son Dalton has been on a tractor since he was 7 years old, and can now do pretty much everything on the farm – including the chile roasting at festivals and Whole Foods. 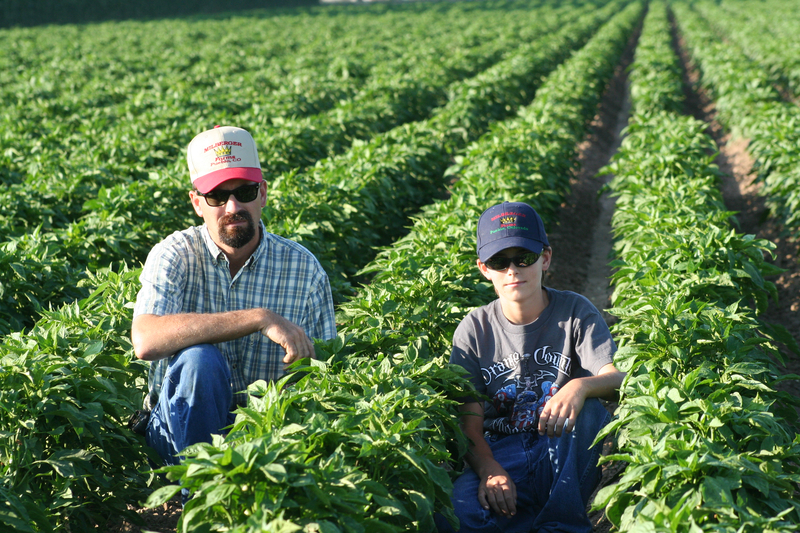 Dalton is heavily involved in the operation of Milberger farms. He is now 16, doing deliveries for the company as well as being the reason for the road-side stand located on Highway 50 – when he was old enough, he asked his father, Shane if they could have a location to sell their products. When you walk into this location, you will be impressed with what they have built. You won’t see anyone else in the country using the chile roasters used by Milberger Farms. These chile roasters were designed by a friend of Shane’s – Pete Giodone – and are created to actually peel the chile. When the chiles come out of his roasters, they are 95% peeled – a nice perk for people wanting to package the chile immediately. Milberger’s roasters are the only machines that can do it. The cleaning capabilities of the machines have enabled Shane to customize packages for customers (1-2 pound packages). When Pete Giodone passed away, Shane felt obligated to take care of Giodone’s customers, and took over his operation of roasting and selling chiles 10 years ago. Now he has and continues to gain a large clientele and market. This season, Milberger Farms will grow a myriad of fine chiles and mixed produce including: chile, bell peppers, cantaloupe, watermelon, sweet corn, basil, dill weed, pumpkins, onions, cucumbers, summer/winter squash, alfalfa, pinto beans, field corn, radishes, red beets, lettuce, sweet peas, fava beans, asparagus, and more. Milberger Farms, as the exclusive chile roaster for the Colorado Chile Chili Fest, will be bringing their state of the art chile roasters to roast both chile and corn at the event. Milberger also works with the Mira-Sol Chile Corporation, which creates a line of five salsas. Twelve farmers from the area are involved in this operation. Milberger also makes two of their own salsas, and a bar-b-que sauce. All of these items are canned and processed locally. These will be available for sale at the Chile Chili fest on September 3rd. You can also visit their website at: www.mirasolchile.com. Due to the chile and the packaging that Milberger Farms developed, six years ago Whole Foods contacted Shane – they wanted a locally-grown product for their chile customers. The people and leadership within Whole Foods started building a relationship Milberger. Whole Foods will bring their team out to visit/tour Shane’s farm to give them more knowledge about who the people are, the processes, etc. This in-turn allows them to relay positive comments about the produce because they have been to the farm and have been a part of the operation. Milberger also supplies chiles to King Chef Diner in Colorado Springs. King Chef wanted to use local, Colorado chile. Milberger started supplying chiles for restaurants, and now also provides chile for their salsas. King Chef has two restaurants in Colorado Springs and you can purchase their jarred product at Whole Foods Market. Milberger Farms retail market is located at 28570 E US Highway 50 , Pueblo, CO 81006 – call for their hours (719-948-3305). Come and get your FRESH, FIRE-ROASTED CHILE at the second annual Chile Chili Festival in Castle Rock, Colorado on September 1st! There is also a website: www.MilbergerFarms.com. Pingback: Fire-Roasted Jammin’ Jelly from Hacienda Maize | That's Natural!